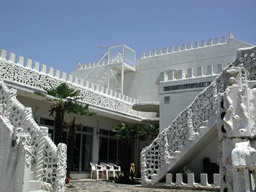 At one corner of the residence quarters, a white spanish style building appears, which is Seishi Nakamoto Private Museum. He made most of it by himself except the foundation work. That is one of his art works. 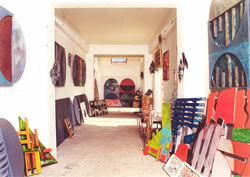 The museum is on the second floor, and it is open for people to see his works all the time. His works, the objects made of iron plates, half cubism arts using iron and wood, paintings e.t.c which show his intensive individuality, are exhibited. This is the place where anyone can see and feel Modern Arts in Nakamoto's world. Also, Museum Concerts have been carried out several time a year, and there are many people who come to enjoy the music. The concert performed by a singular cembalist, Mayako Sone has also been held.